As I was driving my Chinese tutor out to lunch a few weeks ago, a squirrel ran by. She proceeded to tell me about a Secret Society of the Squirrels meeting she had accidentally witnessed. Okay, I made up the part about the secret society, except we have all been suspicious of such a thing, right? Regardless, it was an unusual scene that she came upon. She wrote it down so I could share it with you! But, first, some of the vocabulary. This list is a bit longer than usual, as she tells the story in a very naturally Chinese fashion. (I) wanted to go to the community coop to buy some things. (and) was stunned to see five squirrels gathered around under the tree beside the tree trunk standing on their feet like they were having a meeting and chatting. They immediately dispersed in confusion. I also suddenly came back to reality. I could only sigh that it was too sad that I wasn’t able to capture the scene in a photograph. ❶ The full word is 旁邊 ㄆㄤˊ ㄅㄧㄢ (páng biān), but you will find that native speakers often shorten these common words in conversation. ❷ I found it helpful to look at the individual characters in this word. One of the meanings of 社 is group of families or society. 區 is a picture of its meaning, which is area or region. Thus, the group of people in a given area are a community. ❸ Breaking this 3 character word down helps, too. Notice the character 社 meaning group is at the end this time. The first character, 合, means combine or unite. Next, 作 means to work. So to work combined in a group. A coop. ❹ Without the 下 after it, 停 is more of a instruction or command to stop. Putting the two characters together means the stopping has happened. 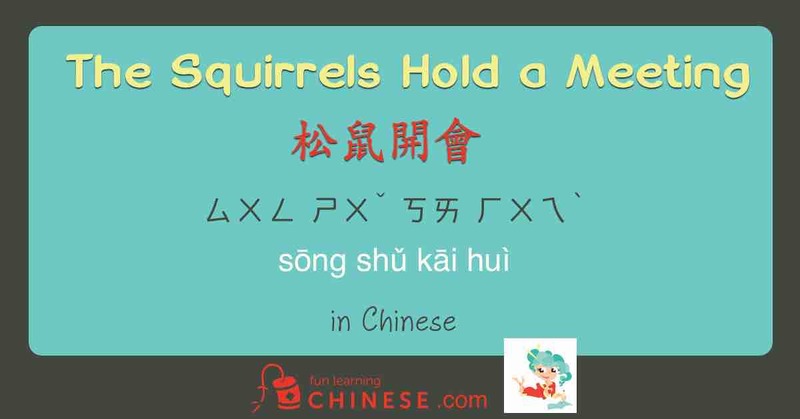 ❺ You have to have fun with Chinese words that sound like the English version of a cat sound! But beyond that, 秒 means second and by adding 鐘 it makes it clear we are talking about a few seconds of time. ❻ 注視 reminds me of the word for television, which is 電視 ㄉㄧㄢˋ ㄕˋ (diàn shì). 電 means electric and 視 means to look at. The comparison helps me remember the meaning of 注視. ❼ There are two characters commonly used to indicate action in progress, 著 and 在. Using either of these characters is basically like adding -ing to a verb in English. 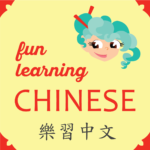 One difference between the usage of 著 and 在 is that 在 is used before the verb it modifies and 著 is used after the verb so as to connect it to a further description. In this sentence, the further description is about what she is watching. ❽ 模樣 shows up in my dictionary with the pronunciation of ㄇㄨˊ ㄧㄤˋ (mú yàng) even though my tutor has heard it as ㄇㄛˊ ㄧㄤˋ (mó yàng) her whole life. If you consider words like the English either, you realize such variations are a normal part of language and we just need to become familiar with them.